We recently had the chance to sit down with Keith Garrison, the current Godfather of NYC CX and the “Keeper of the Cones” for New York City’s famous Wednesday Night CX Practice (see our full guide to NYC CX here). 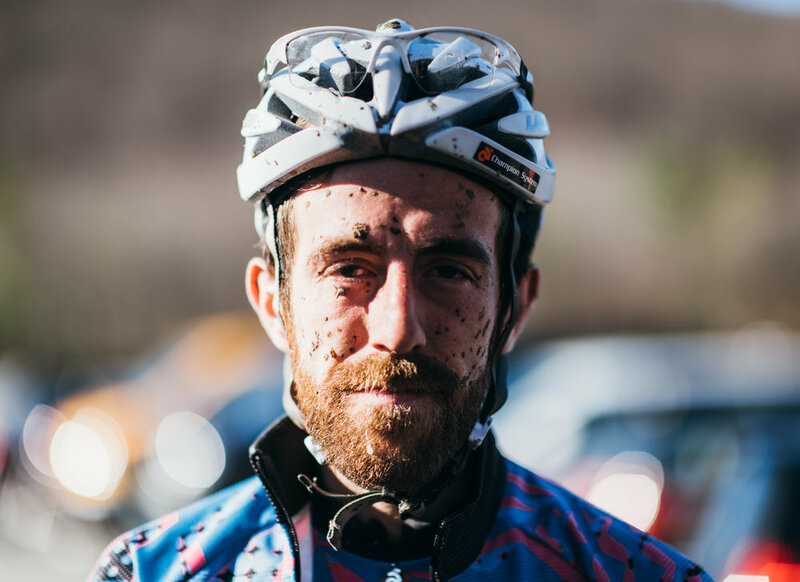 We spoke about his background in cycling, Randall’s Park practice, organizing NYC’s only cyclocross race and his thoughts on the NYC cycling scene in general. What is your background in bikes and how did you get started in the NYC bike/cyclocross scene? I moved to Brooklyn on a whim in 2007 after just having bought a new car. I racked up so many parking tickets the first couple of months I was here that my car got impounded. After coming to terms with how much of a headache it was and what a lousy spot I was in financially, I took it off the road and parked it at my parents house. My commute to work was an over an hour by train and bus but could be done in less than 15 minutes by bike so it only made sense and since it was the end of the 2000’s in North Brooklyn getting a track bike was obviously the thing to do. I had a bunch of friends in the punk and bike messenger scene at the time so I got into racing alleycat races at first. After a few years of needlessly risking my life in traffic to try to win t-shirts that didn’t fit, a friend convinced me to come out to the Kissena Velodrome and give sanctioned racing a try. I stuck with track racing for a few years and occasionally dabbled in road racing here and there but I wasn’t that into it at first mostly because the scene seemed so intimidating compared to track. I started seeing all the hype building around cyclocross and it looked really fun so I rented a bike from NYC Velo and took a train out to a race in New Jersey without any real idea exactly what I was getting into. I crashed a whole bunch but still had a blast and was totally hooked. I spent the next summer gathering parts and finished it the night before Nittany Lion Cross the following year. The rest is history. Have you participated in any organized sports previously to racing bikes? If yes, did any of the lessons learnt there translate? I played ice and roller hockey in middle school and my freshman year of high school but never took it too seriously or played at a super competitive level. I played defense for awhile before switching to goalie. There’s probably some sort of metaphor to draw there with how much stress and pressure I like to place on myself in other aspects of my life. What was the first bike race you did in NYC? My first race was a two day omnium for the Kissena Velodrome opening weekend back in 2010. I remember getting dropped a bunch and being way undergeared the first day and way overgeared the second day. As disappointed as I was in my first results, I was totally drawn in by the community out at the track. Everyone was racing as hard as they could for a few minutes then hanging out in the infield together. After racing a number of disciplines at a high level, what are your personal racing goals these days? My fitness has been on a steady decline over the last year or two partially due to crazy work schedules but mostly caused by an apathetic attitude toward training and a nagging hip/lower back issue, so I’ve shifted away from focusing on my own result-oriented goals and more towards helping others in the cyclocross community. I still try to wrangle as much fitness as I can before the season starts by alternating three weeks off the bike with the occasional 200k ride with teammates. My goals in racing right now are to have fun while trying to not get lapped and to make sure I’m riding whatever muddy or technical feature everyone else is struggling with as clean as possible. Hoping to find the groove again 2019 and come back out swinging. Can you summarize the history of Randall’s Island cylocross practice and how you came to be the caretaker of ‘Cross Practice’ as it exists today? I’m not exactly sure when it began or who started it, I believe Jed Kornbluh is generally credited as the first person to organize the practices. Either way, it was long before I was into cross. My timeline might be kind of blurry but when I first started attending in my 2nd or 3rd season of cross Dan Chabanov was running the practices. Evan and Kyle Murphy joined in and eventually took over for Dan for a year or two. Their stoke and love for sharing their knowledge was really inspiring and got me to really pay attention and try to learn as much as I could about handling and line choices, rather than just coming out and trying to smash as hard as I could to try to measure up against whatever fast people showed up that night. Evan and Kyle eventually moved to California to chase the pro cyclist dream and Dan took back over again. By that time I think I had started to figure out how to turn my bike pretty well and had gotten my Cat 2 upgrade so I occasionally helped out to organize practice when he had other scheduling conflicts. Teaching people was incredibly rewarding and actually helped me breakdown and analyze things that I was doing with various techniques involved in cross. Dan moved to Philly at the end of the 2015 season and left me with the cones for some reason so that made me the new “keeper of the cones”. What motivates you to brave the cold NYC nights and host the practices? I got so much out of attending these practices over the years that I felt compelled to share what I learned from the people that came before me. Seeing people of all levels come out each week and continually improving is incredibly rewarding. People will show up with no-off road experience, having never done a single dismount or re-mount and will be breezing through drills with confidence a few weeks later. We’ve always tried to set up scenarios that mimic course features of races that are coming up. I’ve built a couple of sets of barriers and Belgian stairs over the years so it’s really awesome to have people come up to me after their races on the weekend and be like “Hey that technique we worked on at practice this week helped a ton and I did it every lap of my race”. Seeing people from NYC that consistently show up to practice landing on the podium and upgrading throughout the season (and eventually start beating me in the elite race) is the cherry on top. Practice has evolved over the years and is now even fully permitted - how do you see it changing going forward? When I first started attending there would be a big turnout early season then it would kind of die off to an average of 10-15 people each week. After awhile we started to regularly get 25-30 people. When Rapha arranged for Jeremy Powers to come to practice we had around 45 people show up and we were sure that we were going to get in trouble with the Parks Department. The first couple of practices of the 2017 season had close to 50 riders which was completely overwhelming and after a few weeks the NYC Parks showed up and shut it down as we had maybe gotten a little too confident and slightly irresponsible with the wear and tear we were causing the prior year, so as soon as tire marks started popping up again they took notice and set out to address it. Matt Vandivort of TBD and Lucia Deng of CityMD were pivotal in making connections with the NYC Parks Dept at Randall’s Island as I was boarding a plane to go race the Qiansen Trophy UCI races in China. When I arrived back in NYC a week later, I had a meeting with the Parks Dept to explain our case on how important these sessions are to the community and we came up with an agreement to minimize wear and tear on the park. I submitted an application that evening and had the permit the following morning. Now that we have permission it’s been cool that we can promote it a bit more and encourage more new riders to come out and give it a try. Moving forward I look forward to seeing the next generation step up to help lead practices. The group has gotten so big with such a wide variety of skill sets it would be rad to split up into smaller groups so that people that need more individualized instruction can get it and the fast Cat 3’s that are looking for an ego stroking workout can get that as well. Long term goal would be to be able to turn one of the midweek practices into a midweek night race under the lights. If you’re a new CXer and you want to get started with NYC CX and Cross Practice, what is the best way to do so? Come on out, introduce yourself, explain your riding experience, what you know or don’t know, etc. The whole community out there is very welcoming and happy to show you whatsup. We try to make room for everyone from elite racers to first timers and everyone in between. We’ve had people come out every week that don’t even race cross on the weekends, they just come out because the practices are fun and a good workout. I always tell anyone the hardest part about any of this (bike racing, practice, etc) is just showing up! 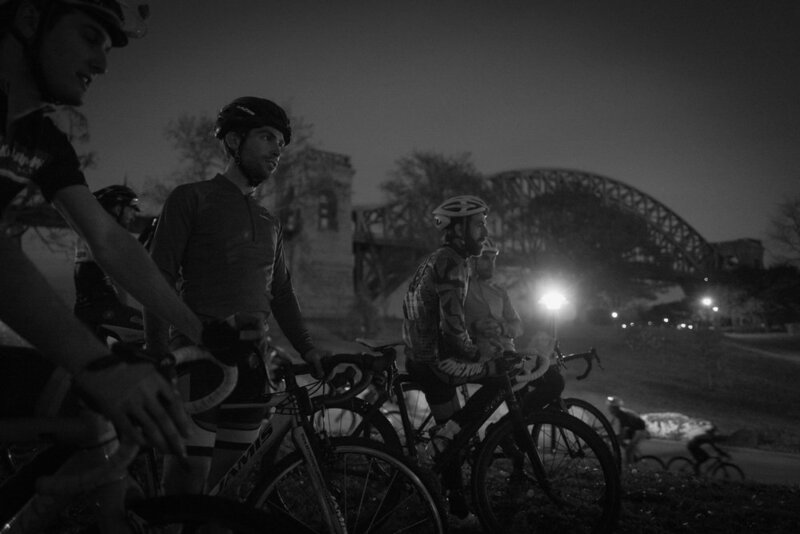 Shifting gears to NYC’s only local CX race, how did the Rainey Park race come into existence? In October of 2016 the NACCC (North American Cycle Courier Championship) was being held in NYC. King Kog stepped up to organize “Bandit Cross”, a popular side event to the main messenger themed race. 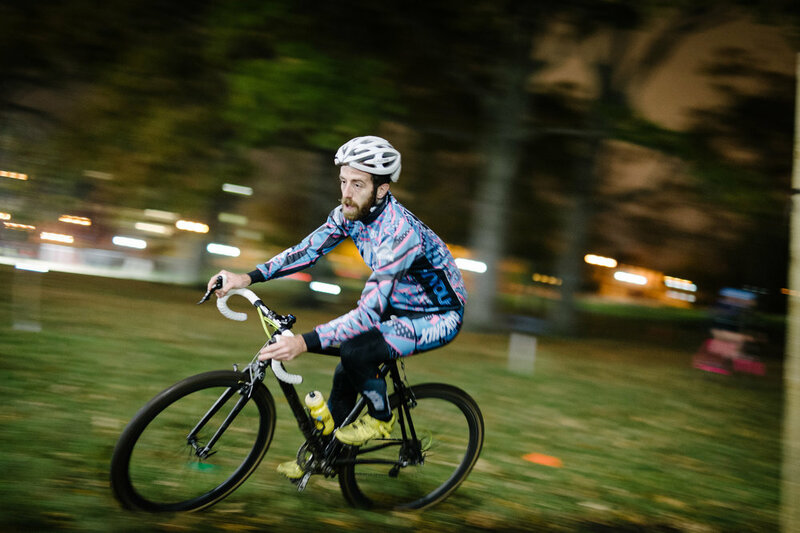 The team set up a cyclocross course utilizing the fields and trails in and around the Kissena Velodrome and held two unsanctioned races on a Friday afternoon for all of the racers in town for the weekend. The event was really fun and sparked a sort of obsession on planning something bigger and better. 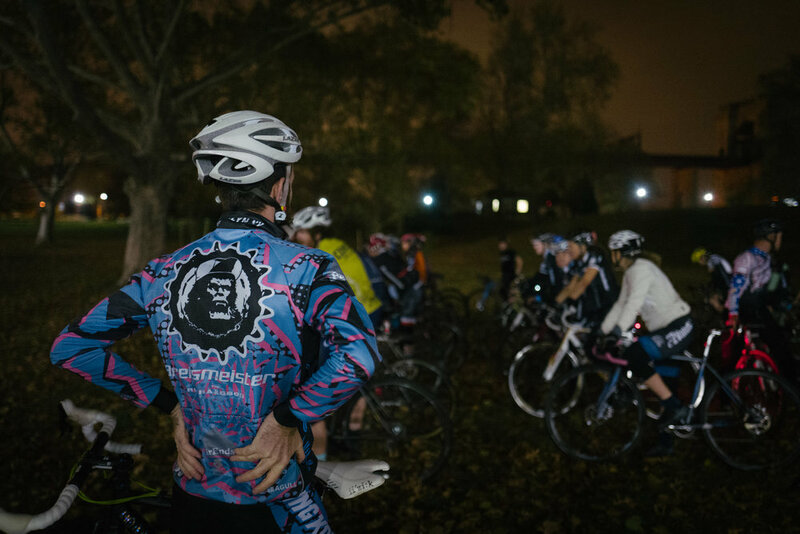 A few weeks later Austin Horse (the organizer of the NYC NAACC and former King Kog CX racer) called me up out of the blue and asked “How do we make a proper cyclocross race happen in NYC?”. I told him I had been planning, budgeting and doing all kinds of research. He helped leverage some contacts and we had a meeting with the manager of Rainey Park in Astoria, Queens. Since it was already November by that point there weren’t too many weekends left in the schedule without conflicting with something else, so we filled a permit for New Years Eve and figured everyone could finish out the year the best way possible. It was also the week before Nationals in Hartford so it seemed like a good opportunity for a last minute tune up for folks heading that way. A few weeks went by and we didn’t hear anything until two weeks before when we got an approved permit. I had just gotten back from a week long work trip in Florida and seemed hesitant that we could pull something together but Austin was insistent that since we had an actual permit for a CX race we had to make something happen, no matter how big or small it was. As soon as we announced it it caught everyone by surprise. People that had hung their bikes up for the year were signing up and offering their help. Myles Romanow of Supercross was also pivotal in getting us set up with NYSBRA and USAC to put on an officially sanctioned race. He also got us access to course stakes, linked us up with Tom Mains for scoring, and offered his advice from years of putting on races of his own. CLIF stepped up to sponsor the race and were a huge help in guaranteeing the success of the first event. Even though the race was pulled together in two weeks and on a holiday weekend, the community came in droves to race and spectate. It felt super surreal until we were packing up all of the equipment at the end of the day. What is the biggest challenge you've faced in running the Rainey Park Cross? The biggest challenge so far has been getting the permits in time. The first year we pulled it all together in two weeks, the second year was three weeks. Luckily this year we got it approved a few months ahead of schedule. Otherwise people have really stepped up to support and lend a hand wherever needed. Do you think it is possible to find other CX venues in and around NYC? What would the hurdle be to bringing more racing to New York City? I think it’s certainly possible. I think the biggest hurdle into getting into other venues is primarily going to be financial. Rainey Park is a good venue because it’s a small park and in a slightly industrial neighborhood, so it’s not super high on the Parks Department radar. It’s New York City, so with enough cash, I’m pretty sure you can do whatever you want. Getting into other bigger and more high profile parks is going to turn into a bigger production and require more money upfront for event fees, bonds to cover any damage to the turf, etc. I think doing a race on Randall’s Island would be awesome. I’ve always wanted to do a race out at the Kissena Velodrome in order to get people that have never been out there to see where it is and maybe help grow the track racing scene. With enough financial incentive I’m sure Prospect or Central Park could be convinced to permit a race. It would be cool to eventually have a race in each of the five boroughs. My long term vision is just trying to increase accessibility to cyclocross within NYC. I’ve met so many people over the years that just don’t necessarily have the means to get themselves to races - either they were born and raised in NYC and don’t have a car, or don’t have the financial means or know enough people to pool together and rent a vehicle; add in the cost to travel outside the city and spend money on gas, tools, food, hotels, etc. and it adds up quickly. There are already enough barriers in cyclocross, getting to the races shouldn’t be one of them. If you could bring one feature from any CX course to Rainey Park, what would it be and why? In a general sense, having sand or a wooded single track section at Rainey Park would be awesome. The park is compact with a bit of varied elevation which makes for a fun course that is easy to spectate without walking a mile from one end to the other. Having a bit more of a variety of surfaces to route the course on would make it even better. If I there were a cyclocross genie I would combine the Koksijde and Namur World Cup courses and move them to NYC - but I guess we’ll make do with what we do for now. You are one of a small set of NYC racers who have also organized a bike race in the city, so you have an unique perspective on the sport in NYC. What do you think the community does well, what does it do poorly? I think my situation is unique, because there wasn’t a CX race in NYC since Staten CX in 2011, which kind of came slightly before the big upswing in cyclocross in the Northeast. Myself, and most of my peer group and teammates spent the first few years of racing traveling 2+ hours to race outside of the city, so having this new event, people wear eager to step up and support it, which I am incredibly appreciative of. I think in a general sense a lot of the NYC scene takes having access to races for granted. I now realize how much hard work and stress go into putting an event on so I try to make sure I thank promoters and officials at any races I do throughout the year. Similarly, if there was one thing you could change about the NYC racing community, what would it be? Everyone loves going out to the big double weekend UCI races but supporting grassroots racing is super important. Making it a point to go out and support local races only makes the event better and more fun for everyone. I’ve been guilty of looking at a registration list and being like “Oh there’s only 8 people signed up for this race, I’m not gonna go” but then I’ve turned around and been like “Oh cool, now there’s 11 people signed up, lets get it!”. NYC has had the same race promoters for over 10 years now (you could probably count them on one hand). It’s something of a thankless task. Where will this next generation of promoters come from? Maybe I’m optimistic but I think no matter what there will always be someone willing to step up and keep things going but it’s on the current promoters to pass down their wisdom, knowledge and most of all connections to the new generation to keep access to venues, street closures and permitting, etc. When we first announced Rainey Park in 2016 Myles Romanow called me up and said something to the effect of “Who the... what the... how the hell… Do you have any idea what you are getting yourself into?” Rainey Park wouldn’t be what is is without the help and knowledge of him and Tom Mains of the NJBA. I think even more important than race promoters is getting people to become USAC Officials. NYC has had a shortage of officials for the last few years and even if there are more promoters, the races can’t happen without Officials. A huge thank you to Keith for taking the time to answer our questions, and for everything he does for the NYC cycling community. If you want to give him a follow on Instagram he’s @keithgarrison. For additional interviews on the TBD Journal head over to Interviews.